Having recently been to South Mimms, North Mymms seemed the obvious next place to visit. (Apparently South Mimms can be spelt with either an 'i' or a 'y', while North Mymms always takes a 'y'.) I'm glad I did. It's just a mile and a half from the M25, and a mere twenty from Charing Cross; what's more, traffic on the A1(M) rushes past only about 500 yards away. Yet it's almost rustic, set in rolling parkland; you're only distantly aware of the nearby maelstrom. The church essentially dates from the early 14th century, and is in that subcategory of the Gothic style known as Decorated. Decorated (or 'Dec' as it's familiarly known) is pretty indisputably the best Gothic style; I continue to lament the fact that round about 1350 masons decided to switch to the more austere Perpendicular style. * What were they thinking? ** At North Mymms the most noticeable feature of the Dec style is the net-like reticulated tracery in all the windows, but the architecture, attractive though it is, isn't really what makes this church worth going to see. 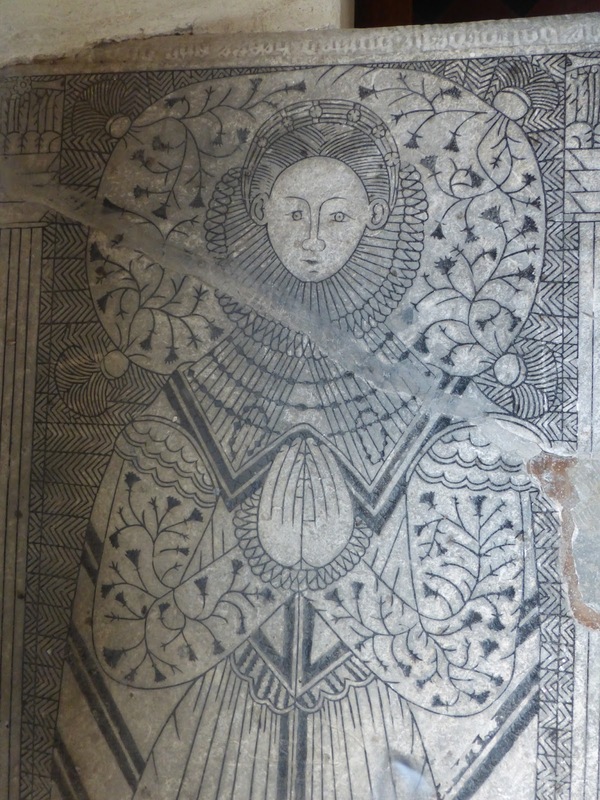 In the north aisle there's a tomb-chest of the late 16th century, with the extremely striking figure of a woman incised on the top. The lines are picked out in what is said to be bitumen. She is naively stylised, especially her face; I think the lack of sophistication in the design is one of the things that gives her so much charm. As well as being stylised, she's very stylish. The sinuous flowers on her sleeves and the cushion on which she rests her head make lovely linear patterns. Her small feet poke impishly out of the bottom of her dress; she has preternaturally long legs. There's an inscription, very worn, running around the edges, and on the sides of the chest some heraldry showing chained bears. The church guide booklet calls it the Beresford tomb, and claims that records state that it commemorates two sisters who died in 1584. The date can't be far wrong, but why one effigy for two people? 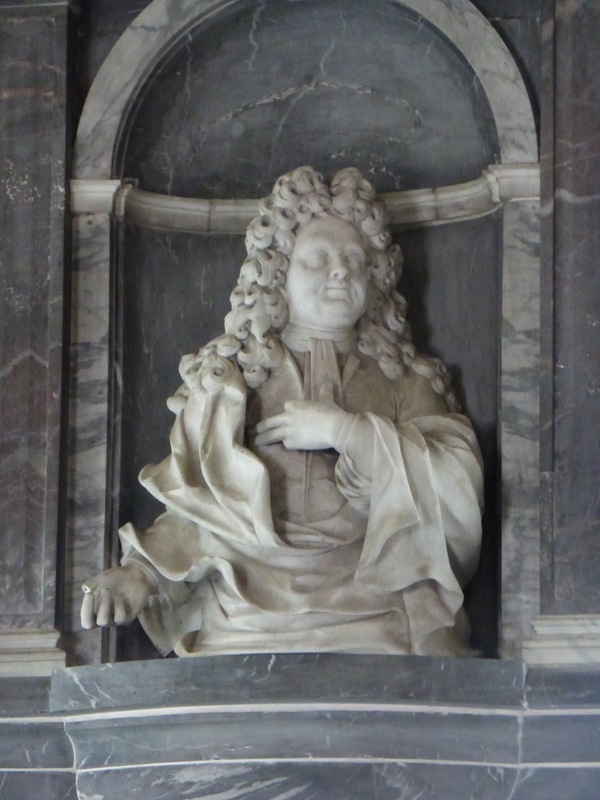 In the chancel there's a large monument to John Lord Somers, who was Lord Chancellor under William and Mary and died in 1716. It's by the highly accomplished Flemish sculptor Peter Scheemakers (he carved the well-known figure of Shakespeare in Westminster Abbey). 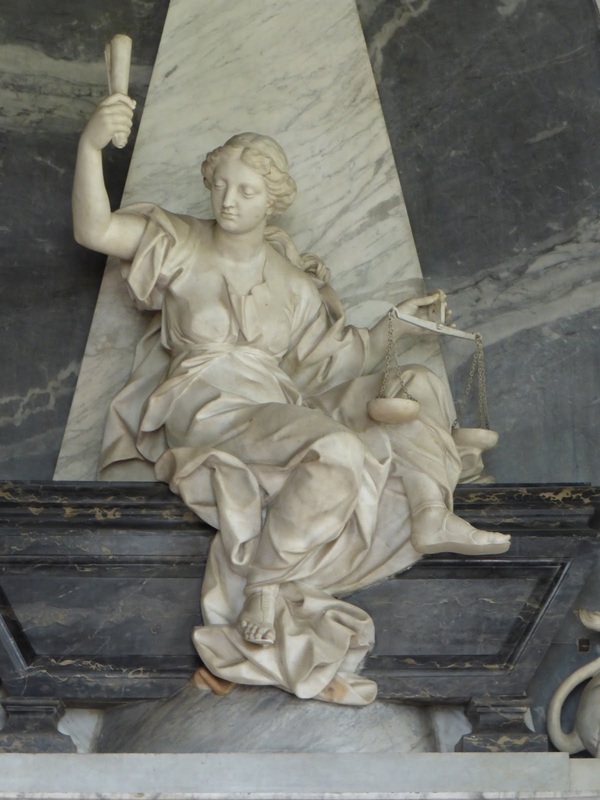 The woman represents Justice; she holds a pair of scales in one hand and brandishes a scroll (presumably containing laws) aloft with the other. 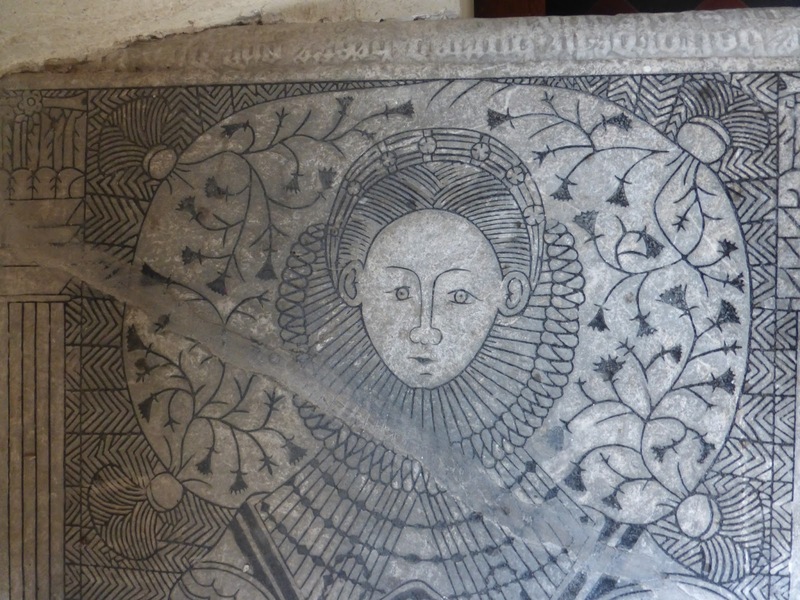 She is dressed in a brilliantly carved and ebullient robe, and is perched precariously on a tomb. She's flanked by genial lions. 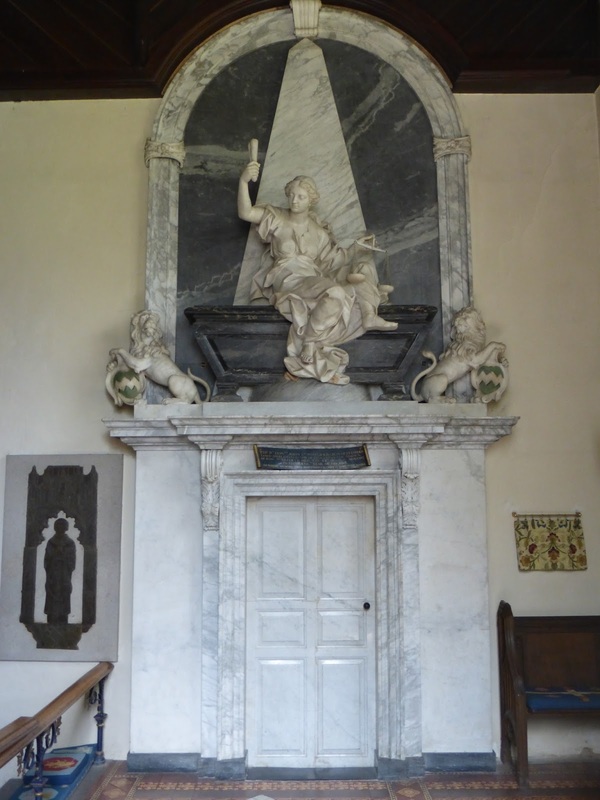 The base incorporates a marble door, which once gave access to the burial vault but now leads, tamely, simply to the vestry. I must admit I find this door disconcerting. It's too chthonic for me. It looks as if it might lead straight to (or straight from) the Underworld. There doesn't even seem to be a lock on it. 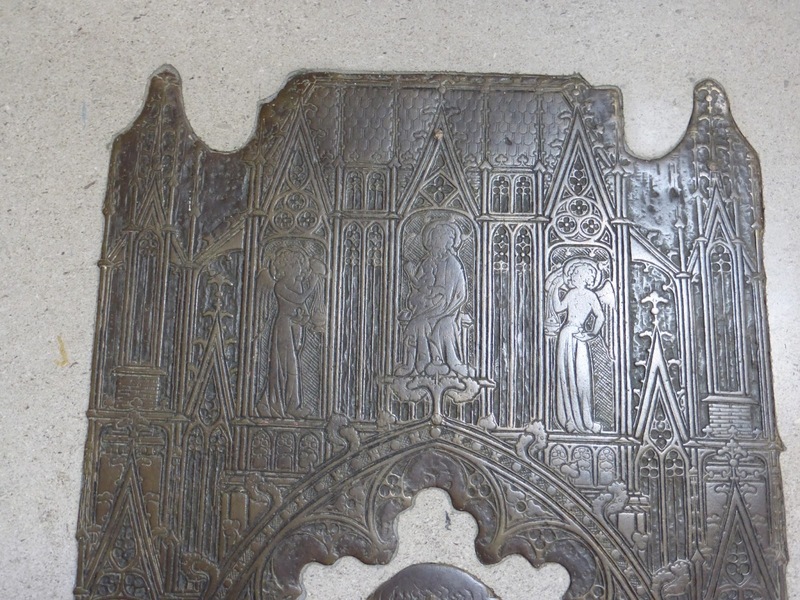 Next to the Somers monument is a brass; I'm not usually very interested in brasses - they're often too stereotypical - but this one's a corker. 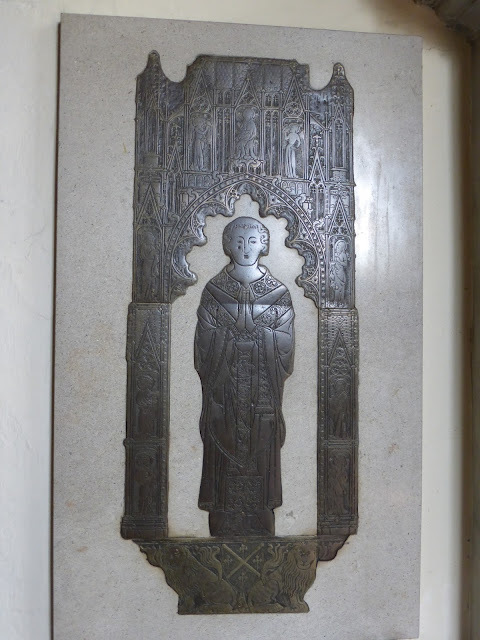 It shows a priest, William de Kesteven, who died in 1361 (so his brass is a fairly early example). At the top are intricate canopies; God sits in the central one with William's soul sitting on his lap. Above the canopies are roof tiles, completing an imaginary building. There are several other monuments and brasses worth a look. 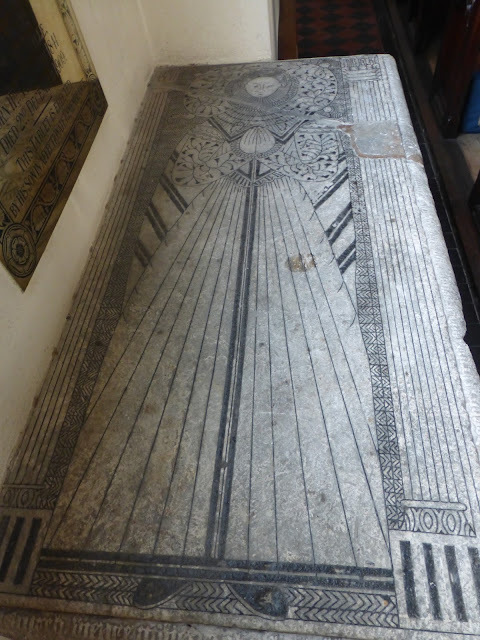 I'll mention just one more, in the north aisle, of George Jarvis who died in 1716. His demi-figure is a bit baroquish; his left hand touches the right side of his chest. Normally it would be his right hand touching his heart. I can't explain this oddity. He looks like a southpaw reaching for his wallet. 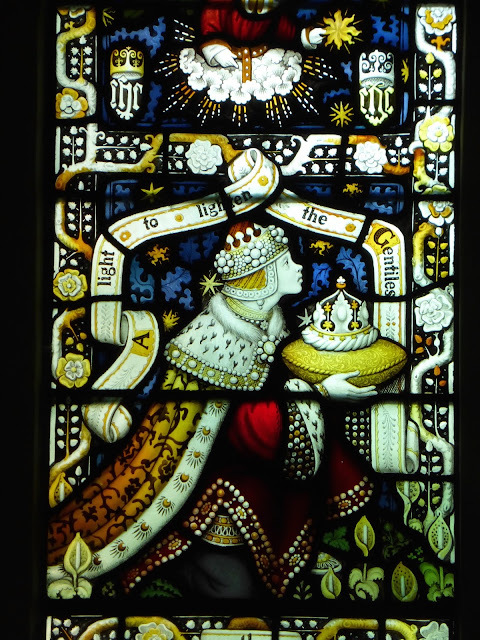 There are also some fragments of medieval stained glass in the north chapel, mostly heraldic, and three Victorian windows, containing those livid electric colours they were so fond of; but I'm rather partial to them too, so that's all right. In the north aisle there's an Edwardian window, (commemorating a death in 1905), a description that normally would make me shudder and move swiftly on, as the early 20th century was (on the whole) a low point in English stained glass. But I like this one. The church guide says it's probably by Ernest Heasman (1874-1927), of whom I'd never heard but seems to be a Hertfordshire artist I should know about. 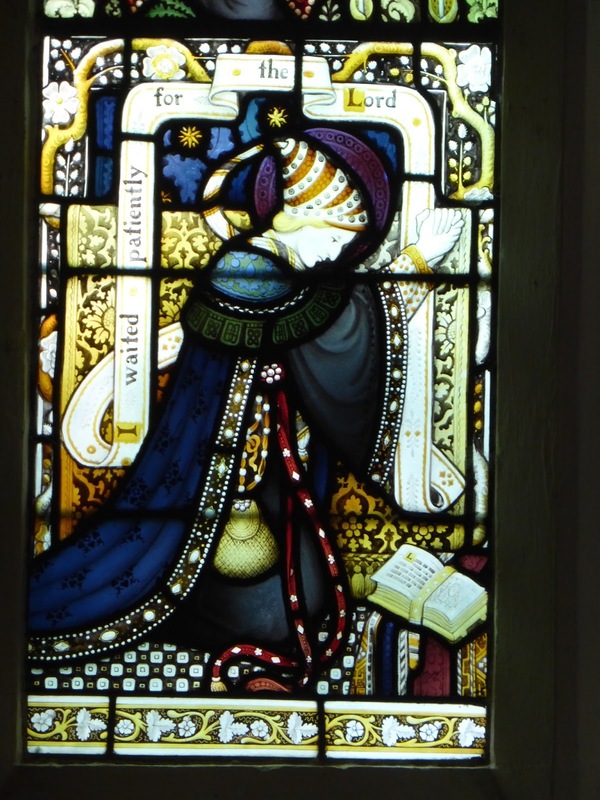 (He's not mentioned in Martin Harrison's Victorian Stained Glass.) On the other hand, the indispensable website Church Stained Glass Windows attributes it to Herbert Bryans (1855-1925), a pupil of Clayton and Bell (the second best Victorian firm of stained glass manufacturers, after Morris and Co.). I like the hat in the second of these two pictures. 'Jewel-like' is a standard term to describe stained glass, and it certainly applies here. North Mymms is an exceptionally welcoming church. It's not only open (despite being isolated and having just a few houses near it) but also has a portable billboard outside welcoming visitors. If only all churches were as friendly. Inside it's a bit murky, because the windows without stained glass have opaque glass. Why? But despite the literal gloom, it feels metaphorically bright and cheerful. 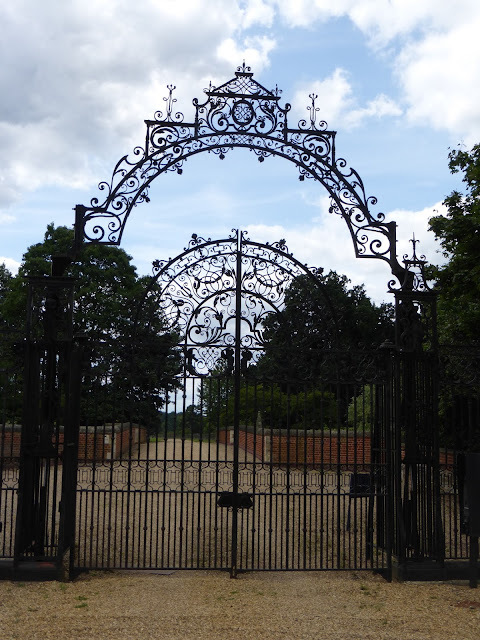 The church is more or less in the grounds of North Mymms House (or Place), a major Elizabethan building, which seems to be completely inaccessible (I think the gardens are open once a year, however). Distant views are the best you can hope for. But you can see this magnificent (?bronze) gate; I assume it's the one Pevsner dates to 1893-4 and calls 'extremely juicy'. A greater contrast to Scheemaker's gateway to the nether regions could scarcely be imagined. * I make no apologies for being upset about something that happened over six hundred years ago. ** Some claim that they were thinking of the very recent Black Death, and that the exuberance of Dec was no longer appropriate. Maybe they felt that God had been punishing them for being too carefree, and that Dec was a visible expression of this blithe spirit. There's something penitential about some Perp buildings - all those endlessly repeating grid-like windows, for example, ground out like a thousand mumbled paternosters. There could be some truth in this, though as far as I know there's no documentary evidence for it. Against this theory it can be pointed out that early Perp, i.e. immediately after the Black Death, when you'd think they'd be most breast-beating, is often highly exuberant in its own way. The choir of Gloucester cathedral is an obvious example.